Is McAfee better than Windows Defender? Read this comprehensive, data-driven comparison make a wise decision. In the modern, digital world, you can’t do without a reliable antivirus suite, regardless of whether you have a PC or a Mac. Do you know AV-Test claims to register over 250,000 new malware samples every single day? Hackers are constantly in search of new (and clever) ways to hijack your computer, breach your privacy, steal your sensitive details, take over your personal files, and more. It goes without saying that a reliable (or paid) antivirus suite is necessary in the modern world of the internet. In this ultimate (and comprehensive) guide, you’ll see the products that both Windows Defender and McAfee offer, as well as how they stack up against each other in terms of features, malware protection, system impact, user interface, and more. If you want the answer straightaway, take a look at the graphic below that summarizes the whole comparison. McAfee offers more protection-related features and extra utilities in its security products than Windows Defender. Independent tests prove that McAfee is ahead of Windows Defender in terms of both malware protection and the impact on system performance. First, let’s look at what Windows Defender has to offer. What’s Included in Windows Defender? 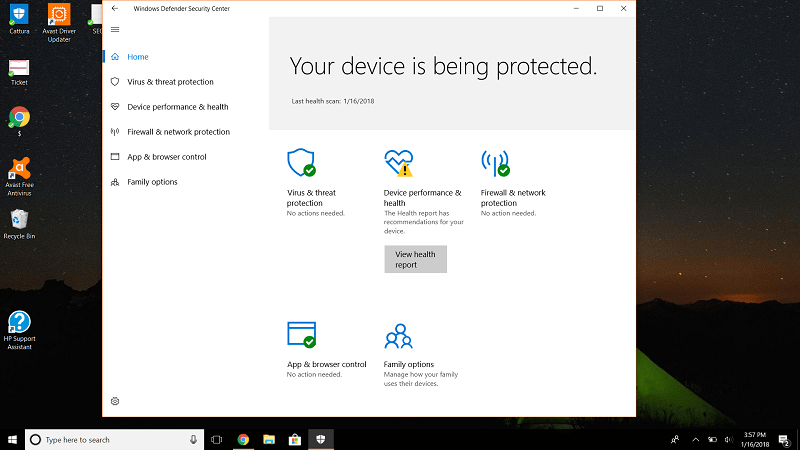 Windows Defender — recently renamed as Windows Defender Security Center — is the antivirus that comes built-in into Windows 8/8.1/10 and into Windows 7 as Microsoft Security Essentials. Unlike other antivirus companies that offer a diverse range of antivirus suites, Microsoft only offers a free version of Window Defender. The freeware is limited in terms of features and extra utilities, but it does have essential features that should be there in an antivirus suite. You can run different time of scans, namely Full Scan, Custom Scan (checks specific files/folders), and Offline Scan (useful if you’re infected by malware). Perhaps the most useful feature of Windows Defender is its Firewall; it monitors network connections and prevents hackers from gaining access to your network. Another handy module included in Windows Defender is parental control. It lets you see which sites your children visit online (but only when they use Microsoft Edge), set when and how much time your kids can use their devices, and more. SmartScreen Filter is also part of the freeware. It blocks malicious websites and also checks downloads for malware, but it only works on Microsoft’s own Edge browser, making it of little use to you if you prefer Chrome or Firefox. Protection against ransomware and rookits is included in the suite. That’s pretty much all that is included in the Windows Defender. If you want additional features/utilities and added protection, there is no paid-for upgrade or additional add-ons offered by the Microsoft. Now, let’s look at what McAfee has to offer. What’s Included in McAfee Antivirus Suites? Unlike Microsoft, McAfee doesn’t offer a free antivirus product. Previously, McAfee used to offer a range of antivirus suites, including McAfee Antivirus Plus and McAfee Internet Security. Now, McAfee offers only two antivirus solutions: McAfee Total Protection and McAfee LiveSafe. McAfee Total Protection is a full-blown antivirus suite, boasting almost all the features you can ask for. Along with excellent, award-winning protection against all sorts of malware, it includes home-network protection (protects your Wi-Fi network), an advanced Firewall, a file shredding utility (helps delete your sensitive files securely so no one can recover them), and a web-based security management dashboard (lets you manage all your devices from one place). A cleanup utility, called QuickClean, removes junk files, cleans up your computer, and improves performance. Vulnerability Scanner (checks for outdated software and other issues) and Silent Mode (prevents notifications for interruption-free experience) option are also part of the suite. With McAfee Total Protection, you’ll also get five licenses of True Key Identity manager; it’s a password manager that can save all your passwords at one place so you can log into your favorite sites/apps without hassle. Parental control features are also included in the suite. For web protection, McAfee offers a Web Advisor browser add-on. It blocks dangerous websites, thwarts phishing attacks, and automatically scans downloaded files for malware. McAfee LiveSafe plan includes 1 GB of secure cloud storage, along with all the features that are part of its ‘Total Protection’ sibling. Note: McAfee’s products are compatible with both Windows and MacOS. Windows Defender vs McAfee: Which Offers Better Malware Protection? Malware protection component is the heart of any security suite. Usually, all the antivirus suites offered by a company use the same malware detection engine. Generally, malware is classified into two types: known malware (widespread malware) and unknown malware (new or zero-day malware). To determine whether McAfee or Windows Defender is better in terms of malware protection, I’ll look at the recent tests conducted by AV-Test and AV-Comparatives – two well-known (and most respected) independent labs that regularly test various top security products on different levels. The most recent AV-Test evaluations were conducted on Windows 10 in March and April 2018. Several security products, including Windows Defender and McAfee, were put to test against 196 samples of zero-day malware and 5,486 samples of widespread malware. McAfee earned an excellent 6/6 star rating courtesy its near-perfect scores. Windows Defender’s performance in these tests was slightly less appealing than McAfee’s, but it still got 5.5 stars out of 6. The experts at AV-Comparatives do several tests to gauge the protection level of different antivirus products, but the two main ones are Real-World Protection Test and Malware Protection Test. The former test exposes a product against real-world conditions (as experienced by users), while the latter tests a product’s ability to prevent malware infections. McAfee received the highest ADVANCED+ award in the AV-Comparatives most recent Real-World Protection Test, due to an excellent protection rate of 99.6% and a reasonably low false positive (false detection of clean files as malware) score of 7. Windows Defender, on the other hand, could only manage the second-best ADVANCED award courtesy its 99% protection rate and a slightly worse false positive score of 11. 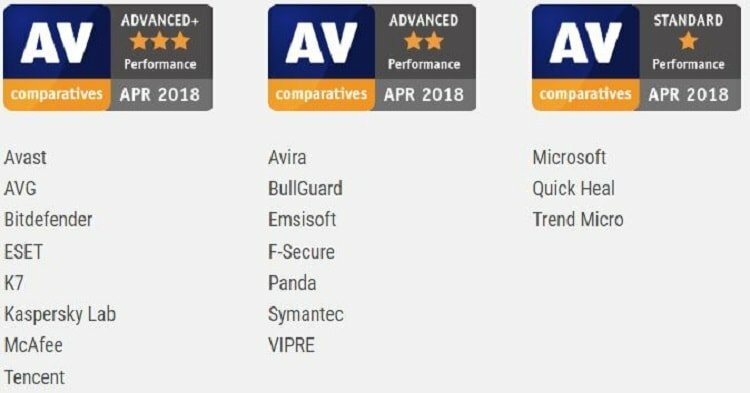 AV-Comparatives’ most recent Malware Protection Test was held in March 2018. McAfee received the second-best ADVANCED award in this test, due to its protection rate of 99.95% and a low false positive score of 10. Windows Defender could only manage the STANDARD award, with 99.99% protection rate and 70 false positives. So it’s clear from the above tests that McAfee is better than Windows Defender in terms of malware protection. Windows Defender vs McAfee: Which Puts Less Impact on System? Antivirus products continuously run in the background to provide real-time protection against malware threats, which means they occupy some percentage of system resources to do their job. So, it’s imperative that a security product shouldn’t put a lot of impact on system performance. 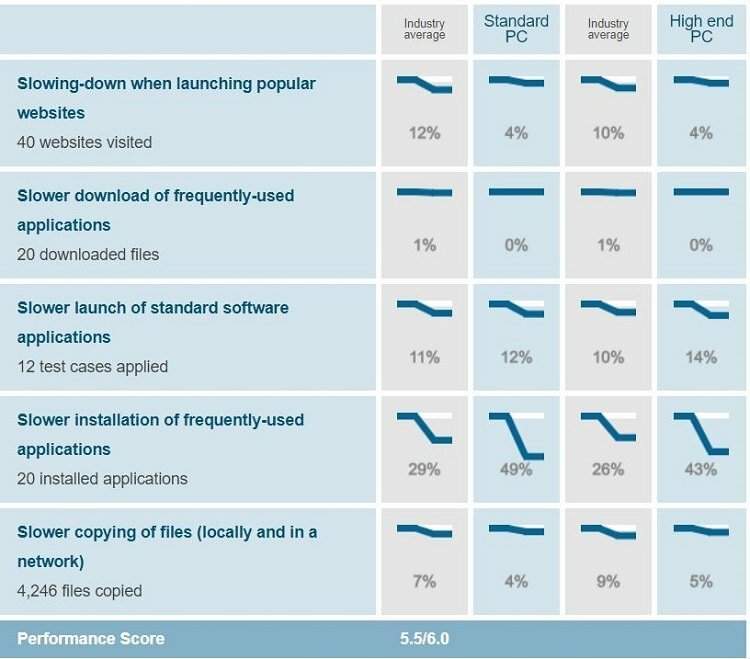 AV-Test’s Performance Test, which was held in Mar-Apr 2018, gauged the impact of each participating antivirus product on system performance by executing few common computer operations — such as launching popular websites, downloading/opening applications, copying of files – and measuring the impact of each operation in terms system slowdown. Both McAfee and Windows Defender received 5.5/6 stars in these tests. AV-Comparatives’ performance study was similar to the AV-Test’s study in a lot of ways. Few common operations – such as archiving/unarchiving, downloading files, browsing websites, installing/uninstalling applications — were conducted and an impact score (the lower, the better) was assigned to each participating product. Interestingly, Windows Defender – which is built into the Windows operating system – received the worst impact score among all participating products, and could only manage the STANDARD award. McAfee, on the other hand, registered an impressive impact score of 6.9, earning the highest ADVANCED+ award from the lab. Hence, it can be said that McAfee puts less impact on system performance than the Microsoft’s default antivirus. Windows Defender vs McAfee: Which Offers Better User Interface? Back in the day, Windows Defender’s interface used to be slightly outdated, but it is no longer the case. Lately, Microsoft has turned the software into a centralized portal from where you can easily manage your security and privacy at one place. The interface is simple and elegant — in colors of white, light gray, and blue – and would sit nicely on any Windows operating system. The Home window is your “security at a glance.” It contains quick links to the following modules: Virus & Threat Protection, Account Protection, Firewall & Network Protection, App & Browser Control, Device Security, Device Performance & Health, and Family Options. Each module contains related features and their settings. McAfee’s interface, too, has recently gone through an improvement; it’s now much simpler and brighter, in shades of white, pale blue, and dark grey. A horizontal menu at the top has following five modules: Home, PC Security, Identity, Privacy, and Account. The Home tab, which is the default screen, displays your protection status and also has buttons to run different types of scans. You can also clear your browser of cookies/trackers directly from this window, too. The next three modules contain relevant features and their settings. The Account window has information about your plan. Overall, both Windows Defender and McAfee boast simple and user-friendly interfaces. Windows Defender vs McAfee: Which Is Cheaper? Since Windows Defender is free and McAfee does not offer a freeware, no comparison can be drawn between both software in this category. Winner: No comparison can be drawn. 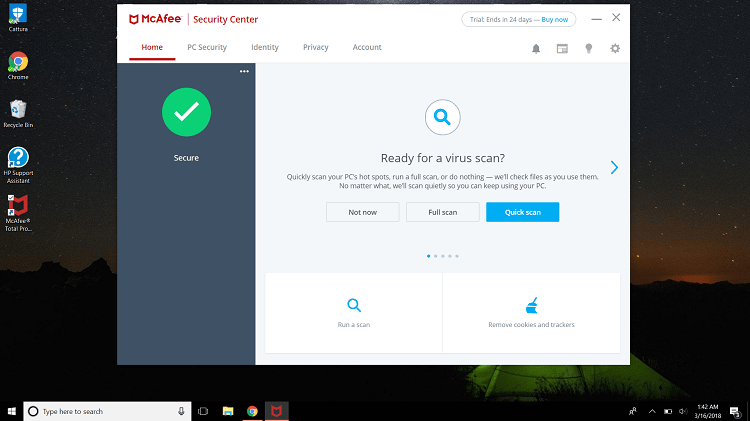 McAfee not only offers more security-enhancing features and extra utilities than Windows Defender but also offers excellent malware protection with minimal impact on system performance.